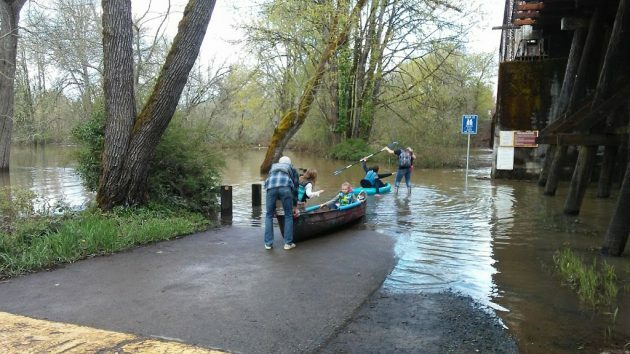 The Bryant Park road became a boat ramp on Friday afternoon. There’s not much to say about it, except that boating in flood waters for fun is not exactly recommended. Imagine all the crud that has washed down from inundated parts of the valley, and that means not just the earthy sediment that has turned the water into a brownish sludge. But then, just for novelty’s sake, it may seem just too tempting to go out there and paddle around where normally people park their cars and kids run around on the playground. 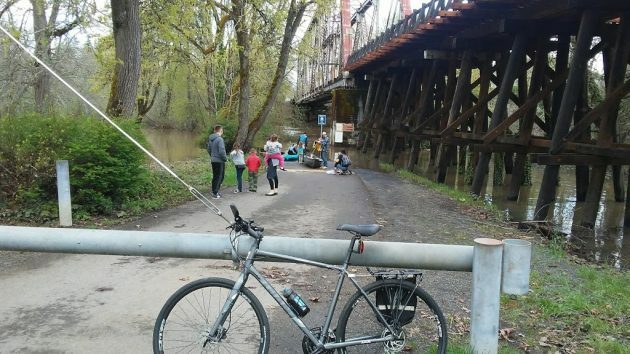 As a kid growing up in the Willamette & Santiam flood plains, floods often were the best of times. 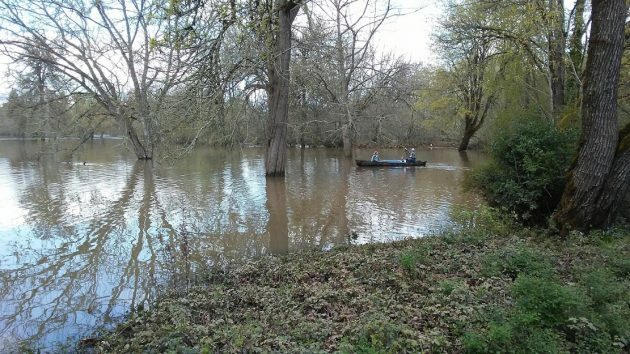 Various neighbors would launch boats next to our house, and then the boat rides across the flooded fields to the fully flooded rivers were magical. The juncture of the two rivers in full flood was a maelstrom, judiciously skirted. And after the waters receded, we would spend months picking through the debris drifts scattered up and down the river. Exploring the damaging holes left washed out of fields inspired awe. Rarely did we give thought to the dangers. Today’s flood waters bear the gift of humanity, trash. Thanks for the memories, HH. O,o,o for sure. Let’s experience a flooding. Bring the kids. Lets put them in a water craft ..yes, at least with “flotation” jackets on for safety & launch. We’ve got it…. Do you dangle you’re kids over the rim of a volcano in Hawaii also??? We don’t know Max’s age. Guessing he’s from a time and place when folks devised their own entertainment. Kids learned self-sufficiency as well as observation and problem-solving.